The previous post described how recent porting of core technology (e.g. substructure query fragment searching) to Objective-C and iOS has opened the door to a variety of calculation types, including atom type-based contribution methods, while the post before that described how the porting of modern fingerprint types has enabled Bayesian models to be used. These progressions are significant, because the previous method of choice for carrying out difficult (or resource intensive) calculations was to hand off the data to a webservice, and await a response. The two technical arguments in favour of taking this approach are slowly but surely eroding: as device capabilities improve, the performance argument becomes less compelling, and as the difficult algorithms are migrated to Apple’s unique and incompatible-with-everything-else development tools, that stops being a problem as well. 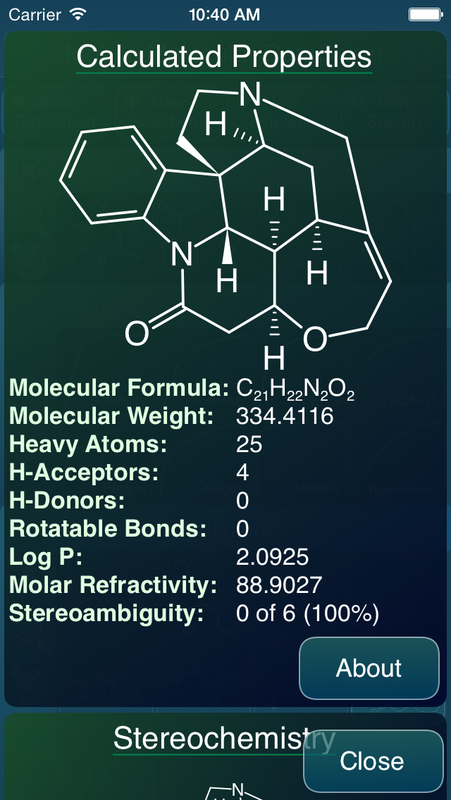 The current version of the Mobile Molecular DataSheet has had two major features retrofitted: bringing up the calculation panel for an individual molecule now displays a wealth of calculated information, some of it in the form of numbers, some as graphically annotated structures. The calculation panel for whole datasheets offers the option for calculating scalar properties for each row, and storing the results in columns, which means that MMDS can be used as a calculation engine for other uses (e.g. QSAR or various kinds of visualisation). 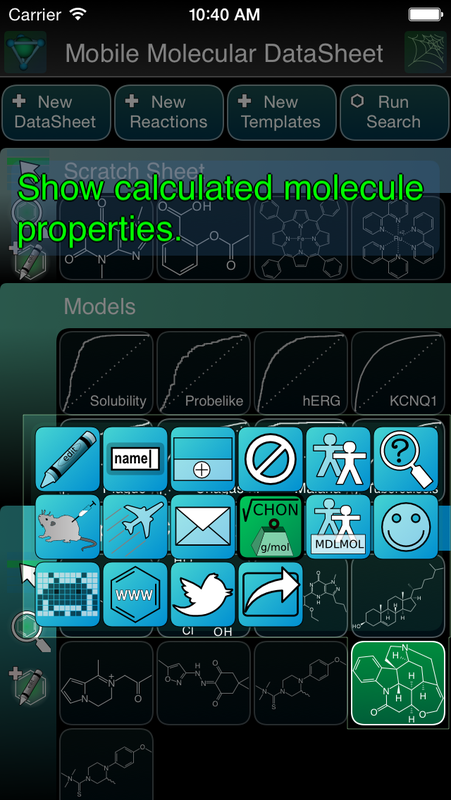 The individual molecule property calculation uses the same code as the MolPrime+ app, which received these new features first (but the second instalment is still awaiting review and should be available soon). Easy-to-calculate scalar properties: molecular formula/weight, # heavy atoms, H-acceptors/donors, # rotatable bonds. Log P & molar refractivity: both calculated by an atom contribution method (published by Crippen way back when), which requires implementation of substructure searching. 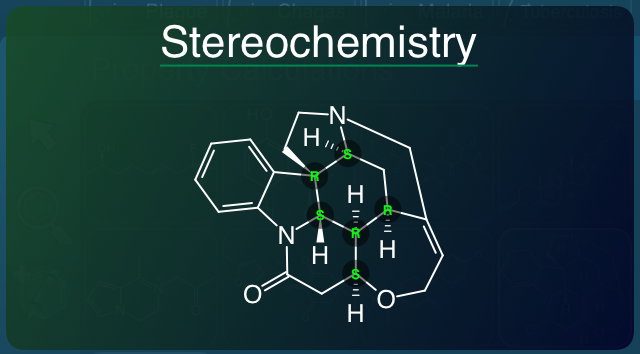 However, it also induces a descriptive field, for counting the number of known/unknown stereocentres, and also the concept of “stereoambiguity”, which is essentially 2-N, where N is the number of unresolved stereocentres (so a compound with one unlabelled chiral or alkene-like stereocentre would have a value of 0.5, whereas a compound with two would be 0.25, etc.). This is the beginnings of an idea referred to as “confidence in chemistry”, which you are likely to be hearing more about soon from Chris Lipinski. 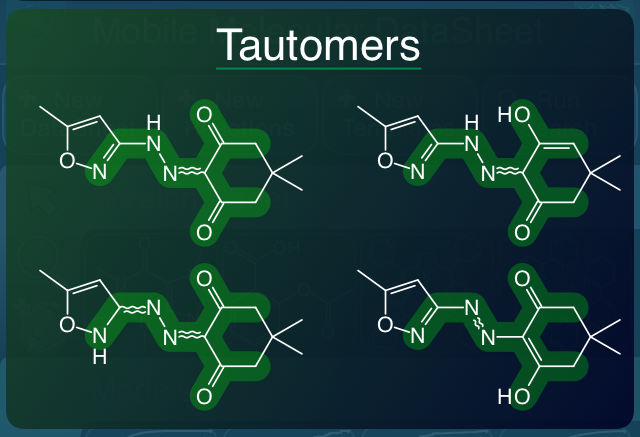 Visually they are shown as a scrollable graphic, and in each case the atoms that are affected by a tautomer shift are highlighted. Any stereocentres that were distinctive in one of the tautomeric forms but have been the subject of one of the tautomer shifts are denoted as being ambiguous. For numeric purposes, a similar idea of “tautomer ambiguity” is calculated, with then confidence being 1/N, where N is the total number of tautomeric forms. 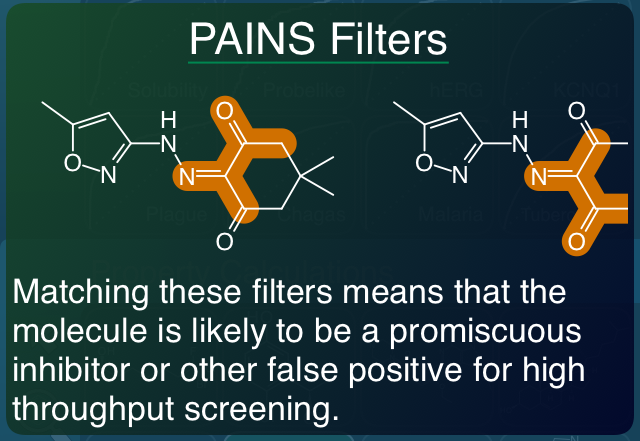 As for tautomers, the PAINS matches are rendered for individual molecules as a side-scrolling collection. 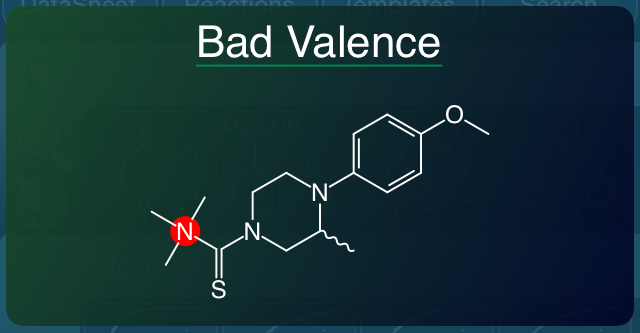 Most compounds hit zero-or-one of these filters, but it is possible to create molecules that hit many of them, and symmetry can crank it up further. 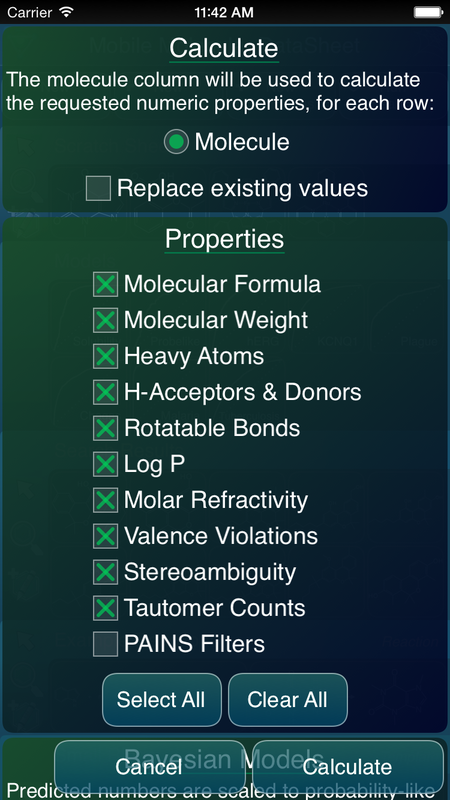 It consists of a checkbox for each of the properties that are desired. By default everything is on, except for the slowest calculation type (PAINS). Note also that the screenshot above shows an obscured section underneath, with the heading: Bayesian Models. This is the next major extension to the MMDS app, and it’s coming soon.